Green building is a term adopted by the whole world that describes the concept of design, construction, finishing, equipping and use of buildings that are based on the principle of sustainability. Green roofs and walls were designed to compensate for lack of green space in the cities, and as an attempt to enrich the environment in order to improve the microclimate indoors and outdoors. The expansion of extensive roof gardens is the result of a significant change in attitudes globally over the past ten years. It is a fact that the environmental aspect of the architecture and design has a constantly growing impact. The famous Hanging Gardens of Babylon (604-562 BC), we may rightly say, were the first example of the green architecture. 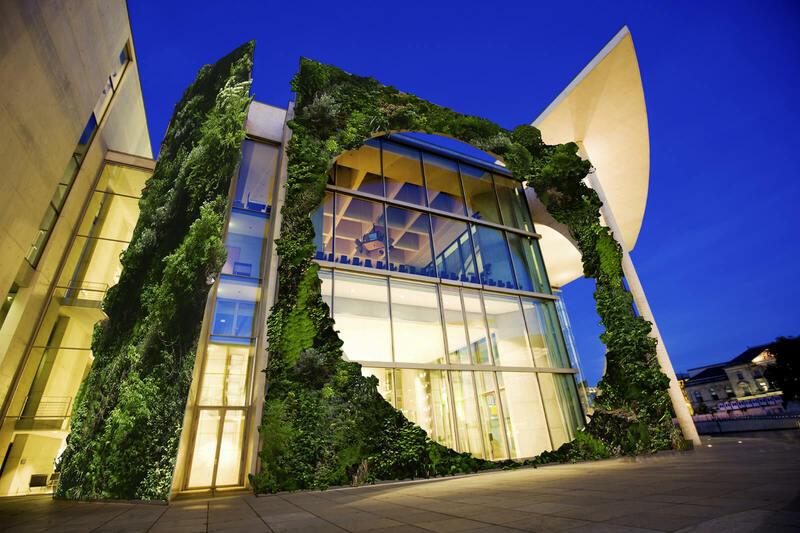 The first examples of modern green architecture were in Germany in 1970s. Today’s green walls have gone much further in the approach of greening and have become works of art. This way of greening allows us to plant a large number of species, different in colours, shapes, height and other visual features. Green walls have multiple advantages. In addition to decorative and visually soothing function, these walls improve the microclimate, enrich the space with oxygen, lower summer temperatures up to 5 degrees Celsius and help maintain optimal humidity. Green roofs are a habitat for insects, birds and plants. The microclimate around the building improves, because the roof covered with vegetation emits less heat. Rainwater is retained on the roof longer and it gradually evaporates, unlike other roofs where rain water flows directly in to the sewer. In addition, the plants covering the roof extend the life of the roof insulation because they protect it against large temperature fluctuations. There is a plethora of benefits of green architecture, from environmental to economic. Properly set green roof lasts longer than conventional one. It has additional economic benefits manifested in reduced costs for the removal of rainwater and in reducing the energy consumption. There were researches conducted that show that the green roofs, seen from the economic point of view, are very good investment, because the life expectancy of green roof is two times longer than the lifespan of a conventional roof. Saving money on energy that is consumed for cooling in summer and heating in winter, depends on the climate, building size and type of green roof and wall that are implemented. Any reduction in temperature of 0.5°C can reduce the amount of consumed electrical energy up to 8%. Green walls can be freely used in the interior. 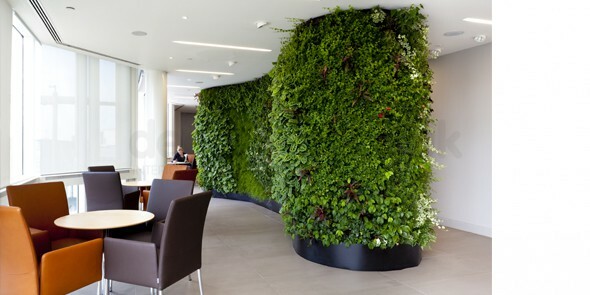 There are numerous examples of green walls installed in the large airport areas, luxury hotels lobbies, cafes, private homes; organic architecture is also present in office spaces. Good examples of such green walls can be seen in Elmich designs. This approach of using the plants in the workplace has a preventive effect, because plants are soothing and they help employees in the fight against stress. Experts in the field of greening patented a centralized system of installation for air purification in the greened spaces; air is filtrated by flowing through the green wall’s root system. Aesthetic function is sufficient reason for the formation of green roofs and walls, because the effect of refining the cityscape greatly improves the quality of life in urban conditions. Green surfaces meet the aesthetic needs of people. Research shows that people who work in spaces with the presence of plants are 12% more productive than people who are working exact same work in a room without any contact with the plants. Global warming is an indisputable fact and our planet is not in the best shape. Given that the construction industry has a major impact on the natural environment, organic architecture, planning, design and green construction have a great impact in simultaneously protecting human health and our planet.